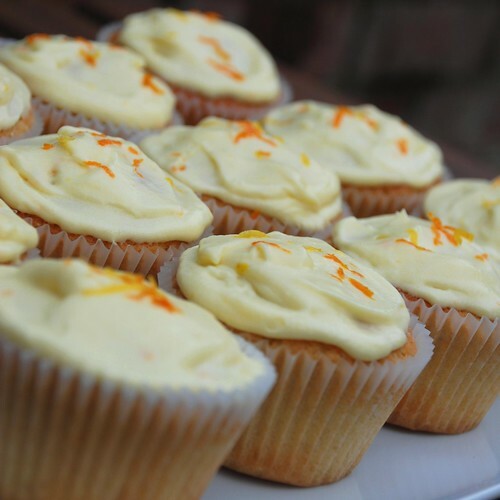 Here are some tangy orange and lemon cupcakes. The frosted topping has Philadelphia Cream Cheese with a syrup of super reduced orange and lemon juice whisked in. I love it when a recipe works out at just the right quantity to fill a dozen good deep muffin cases. Ernie, our Border Terrier is always very interested when I am taking food photo’s. He takes any opportunity when I am arranging things to try and get a taste. If he weren’t on his absolute tippy toes on this shot he would have made a grab for a bun. His photo is also featured at BorderJoy. I am never sure about cakes with cream cheese in the frosting. My instincts tell me that I should put them in the fridge, but I don’t like a cold cake. Let me know what you think; to fridge or not to fridge? I would only do this with my electric whisk, by hand would be hard work. Into Bowl 1: Sift the flour and baking powder. In Bowl 2: Beat the butter very well, add the sugar and beat well again. In a small Bowl 3: whisk the eggs, milk, vanilla and zest. Add 1/3 of the flour mix and 1/3 of the egg mix to the creamed butter and whisk well, add the 2nd thirds and whisk again, add the last 3rds and fold in – although to be honest I end up whisking this one in too. Spoon good tablespoons of mixture into 12 muffin cases in a muffin pan. Bake for 15 minutes and then check and turn them round and if needed give them 2-3 minutes until golden. Beat the butter until pale. Beat in the cream cheese. Simmer the orange juice in a non stick pan until it is reduced down to a tablespoon of syrup. I can confirm that if you leave this unattended it burns easily and welds to the pan. Stir the juice into the icing sugar and then beat this into the butter and cheese mix. When the cakes are completely cooled smear the topping onto them with a spatula and decorate with zestiness. This recipe is also featured in the Fabulous Places Blog. Tip: Avoid ‘Supercook’ muffin cases. They are thin, flimsy, and too big for a muffin tin so you get pleats of paper in your cake. Dr Oetker ones are fine. 28th August: I just made these again this morning. We did not have any oranges so I made it with reduced lemon and lime juice plus a splosh of orange flower water. They still taste lovely. I had one for breakfast! these are a must try! I always wonder about the cream cheese and butter too.. I end up refrigerating just in case. High animal fat can last on counter. It doesn’t go rancid as if it were vegetable oil that was used for cooking (ie deep frying but that means a very long time.) I always leave butter on the counter and never had any trouble. Cheeses are most awesome when left out for an hour before serving a platter but honestly something with cream cheese icing would it truly last very long on the counter? ::wink-wink:: If anything only keep a few out at a time and refrigerate the rest. I would think also the citrus would preserve it as well. The tangy frosting sounds delicious! I love the cameo from Ernie. 🙂 He adds some jazz to the picture. These look fantastic! And…I would fridge, then take them out half an hour before hand. How’s that for sitting on the fence?! What a great shot of ernie! I vote for fridge! Great looking recipe, but I love the photo of Ernie even more! No speech bubbles needed with that one!